My Baba, who was a true Hyderabadi, had grown up studying Urdu as a language at school. So like most speakers or lovers of this beautiful and rich language, he was voluble in expressing his sentiments. One of things we distinctly remember more than three decades after he passed away is his treasure trove of pithy witticisms and very Hyderabadi sayings for every occasion. For those who don’t know, Hyderabadi (Hindi/Urdu) is a dialect spoken by the original denizens of city. Some Farsi, mostly Urdu and Hyderabadi Hindi and a smattering of Telugu, Marathi and Kannada - regional languages of the erstwhile Nizam state –have enriched this delightfully refreshing dialect with its unique intonation and wordplay. Baba was also a true blue Hyderabadi in that he wouldn’t or couldn’t utter a string of sentences without including a couple gaalis or swear words. I am not sure if I dare mention, let alone describe his repertoire of ‘gaalis’, which used every figure of speech possible. Suffice to say, even the vilest of his swear words had underlying notes of humour, affection and caring and take a prize for creativity. Such is the generosity of a Hyderabadi that even the abusee would totally agree with the underpinning wisdom of the ‘gaali’ and be left wanting more, as one would want this biryani. When something was better than nothing, Baba would concede, “Nai mamu sey nakta mamu sahi hai”. The term mamu here is not the shortened form mama or maternal uncle, but perhaps of “maahanmuuttaja” (immigrant/servant). The idiom literally meant it’s better to have a servant with a snub-nose, than not have one at all! When rolling his eyes knowingly at the shrewdness of anyone who happened to have a short stature, he would say, “Giddatan chitnatan”! Gidda, as you guessed, refers to a short man. “Ghar mein nahi jawari, amma puriyan pakari!” was a brutally honest assessment of a situation wherein one was reaching beyond their means. As kids we learnt lessons on time and task management with Baba mildly chided us with “Ein shikar ke waqt kutta sone ku gaya!” Well, one could replace (and surely you can imagine Baba did) whatever the dog was doing during the hunting expedition just when the prey was in sight, without detracting from the meaning or the caustic nature of the comment! So where does this biryani fit in here? Of course, I have some metaphors for biryani, but more about them some other day. This biryani brought to my mind another of Baba’s favourite sayings for deceptive appearances or ostentatious facades, “Upper sey sherwani, under sey pareshani”! Ever since I read all that hoo-ha about jackfruit or kathal biryani in the foodie groups on FB, I have been wanting to make it. I did find some in a Vietnamese market some time ago and bought it excitedly. But no, I didn’t make it then and threw out that piece of jackfruit wrapped in Clingfilm, discoloured beyond recognition as it languished in the fridge for weeks, waiting to see the light of the day. 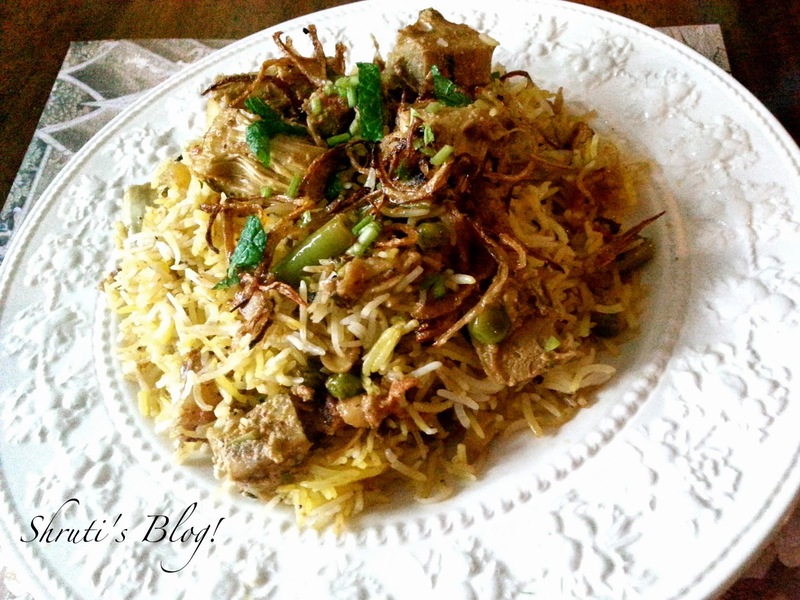 So when I spotted jackfruit again the other day, I decided to finally make this biryani, expressly for some hard-core meat-eating guests. I looked around for recipes high and low. Finally, zeroed in on three sources – three chefs - Sanjeev Kapoor, Sanjay Thumma, the Vah Chef and Rashmi Madan, my soul sister from Hervey Bay. The biryani was a super success in terms of the flavours, the grain, the texture of the kathal, the appearance replete with the perfect birista or fried onions, the pure Spanish kesar, the aroma that wafted down the stairwell and the lift shaft, almost perfect – except – the kathal has a distinct bitterness to it that couldn’t be masked by any of the zillion ingredients I had put in. You can imagine how disappointed and “dismood”(another Hyderabadism?!) I was. I had labored for over 2 hours over this biryani, which looked so good and tasted so super – but for the bitter kathal. Worse still, my guests had either not noticed it, or were too polite to mention it. This was a situation that Baba would have described, albeit kindly, as “Upper sey biryani, under sey pareshani”! Thus heartened, I present my Kathal ki (kadvi) biryani. 3 cups basmati rice, washed and soaked cold water for at least 30-40 minutes. Warm half a cup of milk and add a large pinch of saffron and the kewra water and keep aside. Boil a large pot of water and add the soaked and drained rice. Add the cloves and cardamom and some salt. When the rice is about 80% done, drain out the water. (Keep the water – tastes nice as a conjee). Separate the grain by fluffing with a fork and spread it out in a tray to let it cool. With well-oiled hands and an oiled sharp knife, cut the thick and thorny skin off the jackfruit, well past the spiked skin and marked skin under the spines. Taste the flesh to ensure it’s not bitter. Cut the jackfruit into square biggish chunks. Keep the seeds if they are tender. Wash the chunks in cold water and drain in a colander. Heat oil in a pan and fry the cashews and set aside. Fry the onions golden brown and set aside. In the same oil, deep fry the jackfruit chunks and potato cubes. Drain on kitchen paper. Heat a pan and add about ½ cup of oil and add the bay leaves, the crushed garam masalas, shahi jeera, cinnamon, bay leaves, green chillies and ginger garlic paste and sauté for a couple of minutes. Now add the beaten yoghurt and cook for a while. Then add the Kashmiri chilli powder, the powdered garam masala and sauté for a while. Add the frozen green peas, half of the mint and coriander leaves, fried cashews and the fried jack fruit chunks and the fried potatoes. Add salt to taste. In a deep micro-wave proof casserole spread a layer of rice sprinkle some fired onions and coriander and mint and top with a layer of the jackfruit mixture. Repeat until the rice and jackfruit mixture is used up. Top it with some fried onions and the coriander and mint leaves. Sprinkle the saffron and milk mixture on the top. Finish the topping with some melted ghee. Cover the casserole with a lid and cook in a microwave on medium power for at least 10 min. You can pop the casserole into the oven too, but nuking it in the MW works better for me in terms of the texture. Serve hot with a dahi ki chutney. 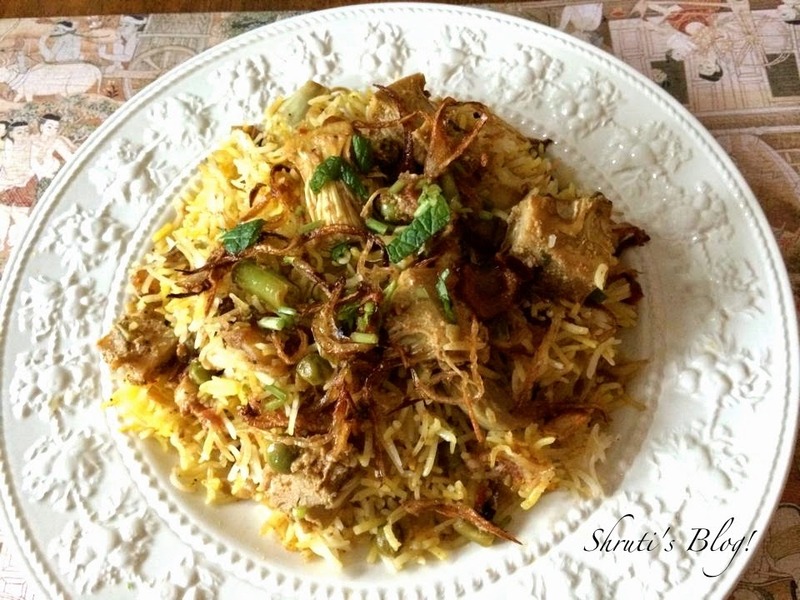 Hi Shruti, i totally loved reading this post and especially the saying, 'upar se sherwani, andar se pareshani' lol...Nice pictures and nice recipe. Thank you Gauri! :) Good to meet a fellow blogger!